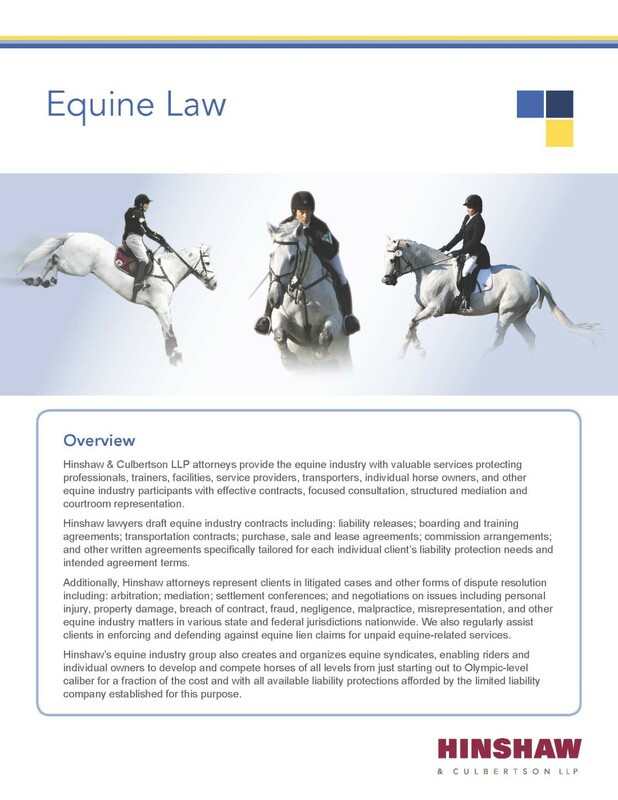 Hinshaw attorneys represent individual horse owners; trainers; breeders; riding, boarding and training facilities; veterinarians; and other equine industry players in a wide range of litigated and transactional matters. Our firm assists clients to litigate and resolve equine-related claims for personal injury, property damage, breach of contract, fraud, misrepresentation, and various other legal issues. We also draft contracts for horse purchases, sales, leases and commission arrangements, and create equine liability releases for boarding and training facilities, trainers, transporters, and other individuals and entities sponsoring or participating in equine activities. Hinshaw also represents Thoroughbred race horse owners and trainers in legal matters involving: breeding; training; purchasing and selling horses; and other legal issues affecting the racing industry. We have also enforced equine lien rights for individuals and equine boarding facilities in various jurisdictions. Our Equine Industry Group members also provide equine law consultations to major equine insurance providers and conduct structured mediations on behalf of insurance companies, individuals, corporations, associations, partnerships and other equine industry entities in need of expedited and cost-efficient dispute resolution. As a representation of our firm's knowledge of the equine industry, a partner in our Chicago office and leading equine law attorney, Yvonne Ocrant, annually presents at the National Equine Law Conference in Lexington, Kentucky, the premier seminar for equine professionals. Ms. Ocrant is also the author of "HEADS UP!," a monthly column on various equine law-related issues published in the Scribe, a monthly magazine sponsored by the Illinois Dressage and Combined Training Association. Her articles are available online at www.idcta.org. In addition, she is the author of "LEGAL BITS," a monthly column responding to equine law-related questions and issues in From the Horse's Mouth, a monthly magazine. Finally, to give back to the equine community, Hinshaw, through Ms. Ocrant, provides pro bono legal services for the Hooved Animal Humane Society (HAHS) in Woodstock, Illinois. She is also a member of the Horseman's Council of Illinois Board of Directors.